According to Stefan Tucker, Belmont, Mich., yes, they are – at least in the St. Mary’s River. Tucker, who graduated from LSSU in 2012 with a degree in fisheries and wildlife management, found wild Atlantic salmon fry in the St. Mary’s River while conducting research on lake sturgeon as part of his undergraduate senior thesis, a requirement for students in the sciences and other fields at LSSU. He published his findings with LSSU biology professors Dr. Ashley Moerke and Dr. Geoffrey Steinhart, and LSSU Aquatic Research Laboratory Manager Roger Greil in the October issue of JGLR. The discovery is not only exciting for those at LSSU, the Michigan Dept. of Natural Resources, and others who have been involved with stocking Atlantic salmon in the upper Great Lakes for more than two decades, but also to anyone who follows the changing dynamics of the Great Lakes, especially in relation to lake trout and salmonids. 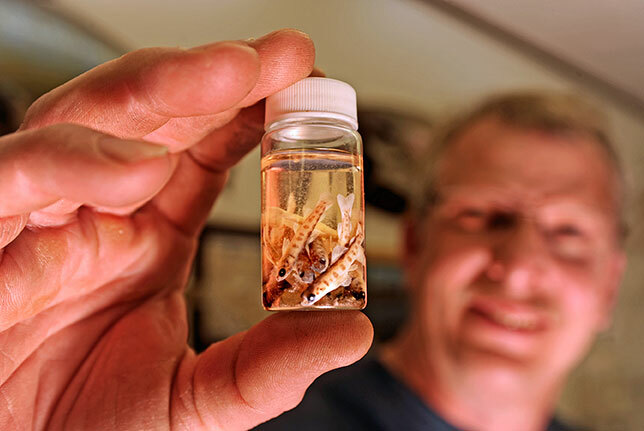 “We were conducting research for my sturgeon thesis when we found the Atlantic salmon fry,” said Tucker. “It was very exciting to everyone who was a part of my research to imagine what we had just stumbled upon. Atlantic salmon (Salmo salar) are native to Lake Ontario; but their populations severely declined by the late 1800s, according to Tucker’s abstract. During the early to mid-1900s, Atlantic salmon were stocked throughout the Great Lakes in effort to reestablish them into Lake Ontario and introduce the species into the upper Great Lakes. However, these efforts had minimal success. In 1987, LSSU, in cooperation with MDNR Fisheries, began stocking Atlantic salmon in the St. Mary’s River. While the effort has resulted in a very successful recreational fishery along with an excellent educational experience for students, it appeared that Atlantics were still not reproducing naturally even though they would return to the river spawning grounds every year. Biologists wondered if competition from other salmonids spawning in the St. Mary’s in greater numbers – including chinook and pink salmon – was keeping Atlantics from thriving. Tucker said unclipped yearlings have been captured in the past, and while they could potentially be naturally produced fish, it is not likely. His study says it is suspected that thiamine deficiency has been a possible factor contributing to the limited success of natural reproduction and survival of salmon, including wild Atlantic salmon in the Great Lakes. It was another LSSU study led by Dr. Marshall Werner and his students in 2006 that confirmed that thiamine deficiency – also known as early mortality syndrome (EMS) – was probably affecting wild salmonids in the upper Great Lakes. Werner’s study noted that the deficiency results from the presence of thiaminase, an enzyme that degrades thiamine (vitamin B1) and is found at high levels in common prey fish, including alewives. After the crash of the Lake Huron alewife population more than 10 years ago, thiamine concentrations in eggs of salmonids and lake trout were found to be much higher. In addition, with the crash of the alewife population in Lake Huron, the chinook salmon population followed suit, possibly reducing competition for spawning areas. Tucker’s senior thesis was “Verification of natural lake sturgeon reproduction in the St. Mary’s River, Michigan.” It expanded upon a growing body of data collected on lake sturgeon by LSSU students and faculty since the mid-1990s. Tucker was awarded an LSSU undergraduate research award to conduct the study, and he won the Best Student Field-based Thesis Award for his research from the LSSU School of Biological Sciences in 2012. Tucker’s research is timely as the MDNR has recently expanded its Atlantic salmon stocking program in the state and is hoping to see these salmon step in for the once abundant chinook salmon, which were highly sought by anglers in Lake Huron. Share the post "LSSU student discovers that Atlantic salmon reproduce in wild"
Categories: Chippewa County, Education, and Hunting & Fishing.